Our specialty is working with small- and mid-sized service firms because we understand that world (as a small service business ourselves). Detati’s BIG (Build. Improve. Grow) Marketing System is designed specifically for small businesses so they don’t pay for things they don’t need and are not locked into all-in-one “marketing” platforms. Clear branding and an optimized website are a small businesses best marketing asset, so that is where we start. You have to have those foundations in place for any digital marketing to work. Then you have the flexibility to add on those marketing efforts that best your business needs. 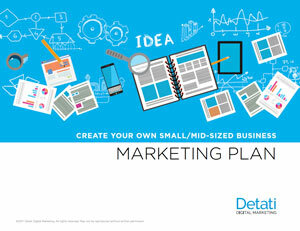 Ready to to kickstart your small business marketing? Request a 30-minute session with one of our small business experts to talk about next steps. Start by making a plan. Try our free FREE interactive workbook. This 2-part workbook will help you figure out your strategy and then create the tactical plan.